Click for larger image Many time recorders use top feed cards that have a matrix of 7 "DAY" columns across the card with IN/OUT spaces down or up the card. 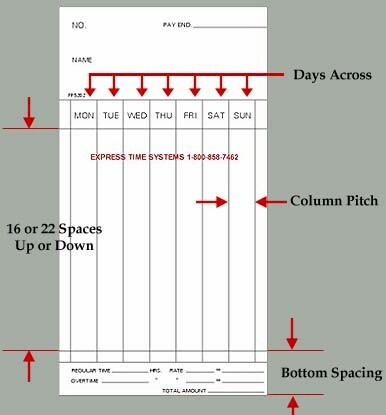 The cards come in a variety of widths and styles for 7 day, 14 day, and even Semi-Monthly pay period cycles. Many time clocks of this style have adjustable card width settings, while others are a fixed width. All clocks of this type automatically cycle across the card for the proper day/date position, and the movement among the IN/OUT spacing is programmed to a particular space at a given time of day. The clocks can generally print in 16 or 22 spaces up or down the day columns and the cards come in different styles to match this spacing. Different card widths are also common. Adjustments and/or programming the time recorder should done by a qualified technician.